A Silver Award was achieved by the Brighton and Sussex Medical School (BSMS), run jointly by the universities of Brighton and Sussex. The awards are valid for four years during which both schools will implement a robust action plan to progress gender equality in their schools. The schools join the University of Brighton’s School of Pharmacy and Biomolecular Science in holding a school level Athena SWAN award. 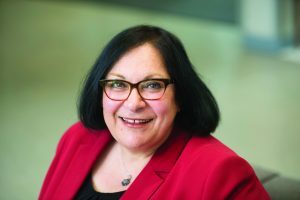 Professor Tara Dean, Pro-Vice-Chancellor for Research and Enterprise, is Chair of the Athena SWAN Steering Group and is University of Brighton’s Gender Equality Champion. She said: “We are very proud that both SET and BSMS have been formally recognised for their commitment to promoting gender equality by attaining the prestigious Athena SWAN Bronze and Silver awards respectively. Kirsty Smallbone, Head of the School of Environment and Technology and member of the School’s Self-Assessment Team, said: “SET’s achievement attests not only to the hard work and dedication of the entire Self-Assessment Team but to every member of staff who engaged with this process, and those who shared their experiences of working in the school. “In doing so they provided an integral contribution to the information we needed to develop an ambitious action plan to advance gender equality and a positive working culture within the school. “The Equality Challenge Unit runs a rigorous assessment process and this award recognises the advancement of gender equality in SET through the development of evidence-based actions and initiatives, designed to increase representation, progression and success for all. The University of Brighton has held an institutional Athena SWAN Bronze Award since 2013 and in 2016 it built on this achievement and became one of only a handful of higher education institutions nationally to achieve an institutional award under the new expanded charter. The new awards will be presented at an ceremony to be in July. Meanwhile, the University is committed to all schools achieving a Bronze Awards by 2020. This entry was posted in Archaeology, Earth and Ocean Science, Environmental science, Geography, Geology, Life at Brighton, News, Uncategorized.